Creating ACTIVE Retirement Years (919) 469-4081 59 Volunteer Today! Are you interested in giving back to your community? Volunteer with the Senior Center today! By registering for this program, you will be added to a volunteer call list for the 2019 Winter/Spring Season. When different volunteer opportunities arise we then contact those on the list for help. Remember this list only lasts for one season so make sure you register each brochure if you want to remain on the call list. 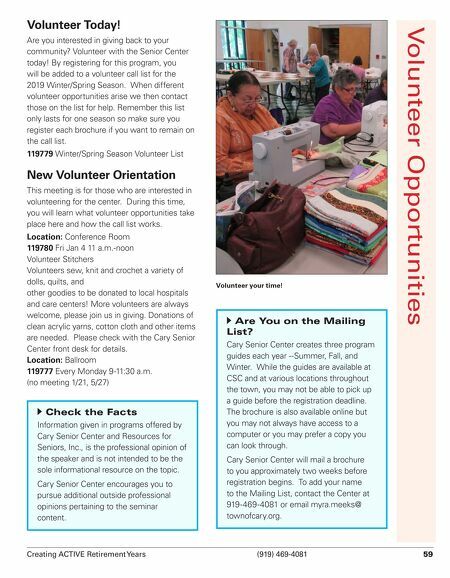 119779 Winter/Spring Season Volunteer List New Volunteer Orientation This meeting is for those who are interested in volunteering for the center. During this time, you will learn what volunteer opportunities take place here and how the call list works. Location: Conference Room 119780 Fri Jan 4 11 a.m.-noon Volunteer Stitchers Volunteers sew, knit and crochet a variety of dolls, quilts, and other goodies to be donated to local hospitals and care centers! More volunteers are always welcome, please join us in giving. Donations of clean acrylic yarns, cotton cloth and other items are needed. Please check with the Cary Senior Center front desk for details. Location: Ballroom 119777 Every Monday 9-11:30 a.m. (no meeting 1/21, 5/27) Volunteer Opportunities c Check the Facts Information given in programs offered by Cary Senior Center and Resources for Seniors, Inc., is the professional opinion of the speaker and is not intended to be the sole informational resource on the topic. Cary Senior Center encourages you to pursue additional outside professional opinions pertaining to the seminar content. c Are You on the Mailing List? Cary Senior Center creates three program guides each year --Summer, Fall, and Winter. While the guides are available at CSC and at various locations throughout the town, you may not be able to pick up a guide before the registration deadline. The brochure is also available online but you may not always have access to a computer or you may prefer a copy you can look through. 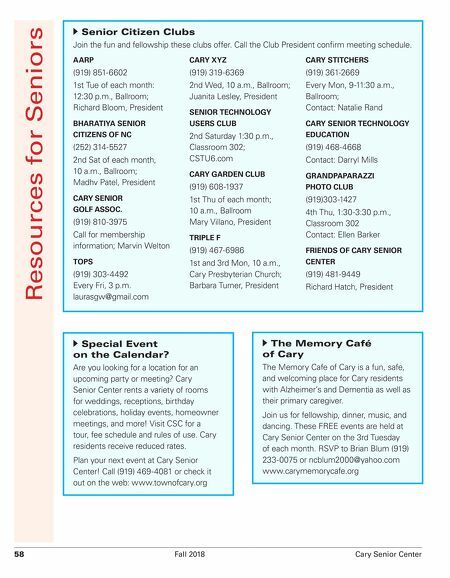 Cary Senior Center will mail a brochure to you approximately two weeks before registration begins. To add your name to the Mailing List, contact the Center at 919-469-4081 or email myra.meeks@ townofcary.org. Volunteer your time!